mile) long stretch of the samba runway in a captivating display of extravagance complete with lavish costumes, choreographed dances, pulsating music, and ornately decorated colossal floats. Starting at 10 pm, the Sambadrome Parade promises to be a euphoric nightlong marathon of breathtaking processions that last well into the following morning. In fact, it’s not uncommon for a Sambadrome Parade to run until at least 6 am. If you’re tired or have somewhere else to be, you don’t have to stay for the entire event; but when that first Samba School enters the Sambodromo, the energy and excitement is enough to keep you running for hours! Book your 2018 Rio Carnival Tickets now on RioCarnival.net! 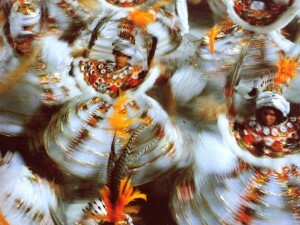 Each Samba School is comprised of approximately 30 wings, or alas, and each wing is made up of around 100 people. Each ala has its own unique costume that helps tell one part of the school’s chosen theme for the year – like a chapter in a book. Every ala, or wing, has a president who ensures that all costumes are up to standards with all their elements in tact. Furthermore, the wing president has the important role of keeping that wing lively and energetic. So if you buy your own costume and plan on marching in the parade, make sure you keep all the different parts! The costumes you’ll see at Rio Carnival are all hand made — from each stitch to each feather! After a year of hard work, community involvement, and intense preparation, the Sambadrome Parade is the moment where members of each marching Samba School has the opportunity to execute their well-orchestrated production. To the schools, the Sambadrome means big business. The songs performed by the most elite schools can easily become huge commercial successes — highlighting the importance of all the time, money and resources they invest to make sure they get everything perfect. By attending the Rio Carnival Sambadrome Parade, you become a part of the schools as they pour their hearts and souls into the drums, songs, dances, and the magic — unlike anything you’ve ever seen before! Each parading Samba School offers something different — and even within a Samba School’s procession, the parade has unique moments that you won’t want to miss. The anticipation of seeing the first member of each Samba School enter the Sambadrome brings excitement the beginning of the samba parades. That being said, by the time the middle of the parade comes around, school members are warmed up and have settled into the routine, so this is when you’re likely to see the most intricate parts of the parade evolve. While the complexity of the middle of the parades is exhilarating, when the end of the school’s procession rolls around, members of the Samba Schools know that for them, that year’s Carnival and the fruits of all their labor is coming to an end. Therefore, they want to make the most of the time they have left. So no matter where you are in the evolution of the parade, the excitement and energy is going to be off the hook! Riocarnival.net will put you front and center at the world’s best Carnival! Those unfamiliar with Carnival may be likely to associate the event with the street parades of Mardis Gras which, like Rio Carnival, is an uninhibited, intoxicated and super-charged celebration of excess and indulgence that leads up to the abstemious period of lent — but Rio Carnival is an entirely different animal! With its vibrant colors and skillfully executed performances, Rio Carnival will be an experience you’ll cherish forever! While the parade through the Sambadrome is undoubtedly fun and games, it is also an intense competition amongst Rio de Janeiro’s premier Samba Schools and is taken extremely seriously. Audience participation doesn’t just enhance the energy of the entire arena, but it also results in more points allocated to the marching Samba School. When a Samba School is at the top of their game, spectators quickly turn into active participants, singing, dancing and chanting as if they are marching with the Samba Schools — it’s really something exhilarating and amazing that must be seen to be believed! Samba Schools that make up the Special Group and the Access Group are considered the best of the best, and the stakes are always high. The Samba School that finishes last in their group is knocked down to a less prestigious group for the following year; inversely, the winner of a samba group in a given year is promoted to a more prestigious group. So the energy and excitement are high at all Sambadrome events — and are equally high at both the Special and Access Group events. Each of the marching Samba Schools is given approximately 85 minutes to parade through the Sambadrome as a panel of 40 judges meticulously rate their performances and ultimately crown a champion. Each and every participant of a parading Samba School has a specific role to play in the procession and it is vital to the school as a whole that each of its members executes his or her role flawlessly. Exceptional skill and execution are both required to ensure high scores from the judges, and to make sure that the school completes its entire performance within the allotted time-frame. The judges, who are seated in booths marked with banners reading “Julgadores”, are spread across the Sambadromo. Each judge focuses on one of 10 categories, making 4 judges per category. Each judge allocates points on a scale ranging from 5-10 (with fractions possible). 1. Enredo: the school’s plot or theme. 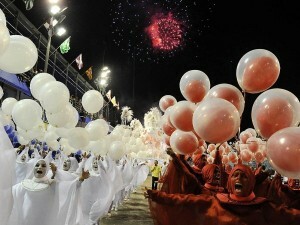 Each year a Samba School must decide on a theme, and are expected to utilize that theme throughout all element of the presentation. Though the theme is among the first elements chosen in preparation for the upcoming Carnival, themes are a tightly held secret until around December when the schools begin to rehearse in full swing. For maximum point allocation the theme must be easily understood and presented with clarity. 2. Samba-Enredo: a samba story. Using the rhythm of the samba tradition as its backbone, the samba-enredo tells a story through song and dance. Like enredo, the samba-enredo is also not disclosed until December. Judges evaluate samba-enredo based on overall presentation and the relation of its plot to the school’s theme. 3. Bateria: the drums. The bateria is judged based on the extent to which the school’s approximately 300 percussionists are able to sustain a constant rhythm. The bateria is the heartbeat that keeps the school’s song and dance ticking. 4. Harmonia: the harmony of the bateria. In this category, points are allocated based on the level of synergy and synchronicity between the dance performed by the school’s passistas (samba dancers which number in the thousands; the bateria (or percussionists); and the singing of every member of the school. 5. Evolução: the evolution of the school’s procession. The evolução is judged by the caliber of the school’s dance with respect to the manner by which it evolves along with the song, rhythm and beat. Evolução is evident in the overall choreography, the skill of the dancers, in addition to the overall level of passion of each school member. 6. Alegorias e adereços: the allegorical references, decorations, and props. In this category, the schools floats are judged. Each schools can potentially parade with more than 8 floats, which are judged based on overall creativity, beauty, decorations, and impressiveness. 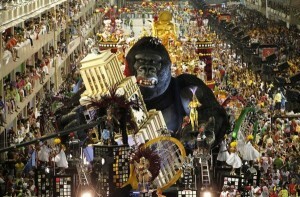 Traditionally the floats will carry celebrities, sports figures, and national icons who have been gathered to support the school and wear its costume. Accompanying the national icons on the floats you will find passistas, groups of around 15-20 of the most amazing samba dancers in the world! Passistas dance to the rhythm of the percussions for the entire length of the parade route. While the more elaborate floats are typically pushed my a group of men, the smaller floats are generally motorized. 7. Porta-bandeira e mestre-sala: the school’s flag bearer and master of ceremonies. The schools flag bearer, a woman, and its master of ceremonies, a man who shows off his dancing skills. The duo marches to a choreographed routine, and is evaluated based on agility and delicateness. Oftentimes this dance can resemble ballet. 8. Comissão de frente e alas: the front commission and the school’s wings. The comissão de frente refers to a team of approximately ten to fifteen school members who are dressed in especially elaborate costumes and typically follow the school’s Carnevalesco, or Carnival Director, in the order of procession. The Carnival Director acts much in the same way as a movie director, organizing everything from theme, to costume design, to ornaments, and the song. As the first official group of members seen by the judges and spectators, the comissão de frente is evaluated on the extent to which they are able to introduce the school’s theme for that year. Typically this is done through costume design. Following the comissão de frente are the alas, or various wings of the school. Each wing is comprised of hundreds of school members dressed in identical costumes. 9. Ala das baianas: the wing of bahian ladies. A school’s wing of bahain ladies, or ala das baianas in Portuguese, consists of hundreds of woman, typically elderly, who march either in the middle or at the end of their school’s procession. The members of the school’s ala das baianas dress in bulgy round skirts to honor the nation’s Bhaian slaves of the past, who are credited for many of today’s Rio Carnival traditions. 10. Fantasias: costumes. The judges evaluate costumes based on the level of creativity, uniqueness, and elegance. The color scheme will typically follow the school’s colors. On Ash Wednesday a winner is declared. The entire nation of Brazil comes to a standstill and is glued to their television sets. Anticipation climaxes as the judges go through each Samba School category-by-category and describe how and why they have decided to give their votes. After the judging is complete, the top six teams of the Special Group are invited back to the Sambadrome on the following Saturday to participate in the Champion’s Parade. 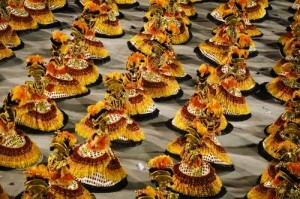 Many Brazilians attend this event and consider it the grand finale of Rio Carnival. The Champion’s Parade is the opportunity for the top-ranking Samba Schools to bid farewell to their loyal fans and to thank them for their support. The Champion’s Parade consists only of the crème de la crème of Samba Schools, and even though the competition is over, the energy in the Sambadromo is electrifying as the crowds cheer on the winning Samba Schools who perform in costume once again, enthusiastically asserting their place at the top. The Rio Carnival 2018 Champion’s Parade will take place on Saturday, February 17 and will start at 10 pm. So, if you are not able to make it to the Carnival Sunday and Monday, don’t worry. The Champion’s Parade is a bit less crowded than Carnival Sunday and Monday, but by no means is the performance any less spectacular! The Champion’s Parade is a favorite among Cariocas and Brazilians, who show up in large numbers to support their favorite Samba Schools. 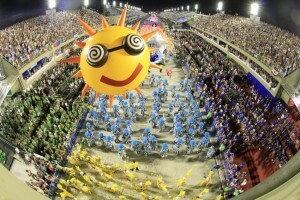 Rio Carnival Champion’s Parade Tickets are on sale now on RioCarnival.net!